Skiatook took the game's opening kickoff and was driving down the field before Walker Roberts (#23) picked off this pass at the 4 yard line at 9:51 in the first quarter. After Roberts's interception, Collinsville's offense started their first possession near their own goal and was unable to gain a first down and punted out to the 40 for Skiatook's 2nd possession. Skiatook was stuck there with Collinsville taking over on downs at their own 40 with 6:14 left in the first quarter. Collinsville ran out the rest of the quarter moving down near Skiatook's goal (in the next three photos). On the 3rd play of the second quarter QB Carson Stout was marked inches short of the goal after about a 5 yard keeper. That was as close as Collinsville got to Skiatook's goal line the rest of the evening. Skiatook took over on downs on the next play at their own 2 and drove to Collinsville's 13 before kicking a field goal for a 0-3 lead with 1:18 left before half time. Hayden West (#33) had the ball knocked loose at Collinsville's 37 and 1:11 left in the half but the Cardinal defense prevented further damage and went to the locker room with the half time score still 0-3. 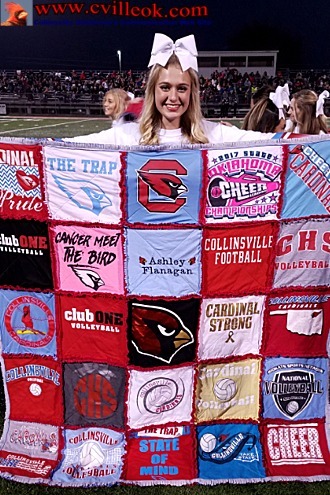 Collinsville's cheerleaders and band entertained at halftime (below). Braden Burd (#22) fielded a short Skiatook kickoff to open the 2nd half and took it to Skiatook's 20 yard line setting up Collinsville's only points Friday at Sallee Field. Seth Weiser kicked a field goal on 4th and 10 from the 20 at 9:36 in the third quarter to tie the score at 3-3. "The Trap" only had three pushups for the evening (following the 3rd quarter field goal) with Carson the Cardinal holding up one corner of the platform. After Collinsville's field goal, Skiatook marched 81 yards for the only touchdown of the game with the final play this 19 yard run at 2:13 in the 3rd quarter making the score 3-10. Jake Tuttle (#21) took the ensuing Skitaook kickoff out to the 45 yard line, but the Cards gained no further than Skiatook's 48 before punting near the end of the 3rd quarter. With 6:47 left in the game Collinsville was facing 4th and 5 from their own 45 and burned back-to-back timeouts wavering between going for it or punting (a mistake Coach Jones owned facing his players post-game). They finally punted and came this close to pinning Skiatook deep with a great effort by Walker Roberts but Skiatook took over at the 20 yard line instead. This was Collinsville's final offensive play of the (5 win - 5 loss) season as Walker Roberts came up short on a 4th and 10 reverse with 2:09 left in the game. Skiatook ran out the clock for an undefeated run thru the district. Collinsville needed either a win over Skiatook or a win by Tahlequah over Bishop Kelly for a playoff opportunity but got neither. 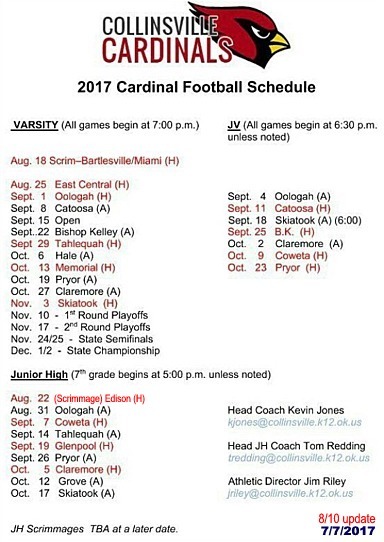 Cardinal Football -- preGAME NOTES -- In one of the states oldest rivalries, its the 95th meeting between Collinsville and Skiatook.